Heads of state and government of ASEAN member states convened in Singapore for the 33rd ASEAN Summit on 11 November 2018. Committing to an open, transparent and inclusive rules-based regional architecture. Underscoring the importance of strengthening ASEAN Centrality and unity. ASEAN convened the inaugural MPAC 2025 Monitoring, Review and Evaluation Meeting. ASEAN convened the 9th ASEAN Connectivity Symposium to review stakeholder feedback. ASEAN launched the MPAC 2025 microsite to raise awareness of the ASEAN Connectivity agenda. Progress was made, results actively monitored and evaluated. Singapore Cooperation Centres was launched to offer technical assistance to host countries and encourage the effective utilization of resources. ASEAN's combined GDP reached USD 2.8 trillion in 2017, a 5.3% growth year-on-year up from 4.8% in 2016. ASEAN's GDP growth is projected to reach 5.1% in 2018 and 5.2% in 2019. ASEAN's total merchandise trade reached US$2.57 trillion in 2017, of which 22.9% was intra-ASEAN. ASEAN's total services trade reached US$ 695.2 billion in 2017, of which 16.7% was intra-ASEAN. Inflows of foreign direct investment (FDI) to ASEAN reached US$137 billion in 2017, of which 19.4% was intra-ASEAN. ASEAN reaffirmed its resolve to advance the AEC agenda and double intra-ASEAN trade by 2025. ASEAN signed the Agreement on Electronic Commerce that aims to facilitate cross-border e-commerce transactions and drive e-commerce adoption in the region. ASEAN endorsed the Digital Integration Framework that aims to bolster regional digital integration, especially for MSMEs. ASEAN completed the ASEAN Readiness for the Fourth Industrial Revolution assessment. ASEAN signed the First Protocol to Amend the ASEAN Trade in Goods Agreement (ATIGA) to allow the operationalization of the ASEAN-wide Self-Certification Scheme. ASEAN signed the Protocol to Implement the 10th ASEAN Framework Agreement on Services (AFAS) to provide ASEAN service providers preferential services market access into ASEAN markets. ASEAN concluded negotiations for the ASEAN Trade in Services Agreement (ATISA). ASEAN endorsed enhancements made to the ASEAN Comprehensive Investment Agreement (ACIA) to prohibit the imposition of performance requirements on investors. Commenced implementation in five ASEAN Member States (Indonesia, Malaysia, Singapore, Thailand and Viet Nam) on 1 January 2018. Progress was made by Brunei Darussalam, Cambodia and the Philippines to join the ASW. Lao PDR and Myanmar were encouraged to expedite development of their National Single Windows so as to join the ASW. Regional Comprehensive Economic Partnership (RCEP) negotiations advanced to the final stage and is to be concluded in 2019. ASEAN hosted a Leaders' gathering on the sidelines of the Annual Meetings of the International Monetary Fund (IMF) and the World Bank Group that aims to advance the Sustainable Development Goals and overcome development gaps in the region. ASEAN is on track to meet its targets of 23% renewable energy of total energy mix by 2025 and energy intensity reduction by 30% by 2025. ASEAN and the International Renewable Energy Agency signed a Memorandum of Understanding. ASEAN endorsed key recommendations of the Gas Advocacy White Paper to enhance Liquefied Natural Gas (LNG) cooperation and trade. ASEAN endorsed the Capacity Building Roadmap on Energy Investment and Financing for ASEAN to enhance regional capabilities to attract investments and develop sustainable financing. accelerate infrastructure development and financing in ASEAN by mobilizing private capital, and advance financial integration in ASEAN by strengthening private market financing opportunities for promising ASEAN growth enterprises. facilitate the sharing of information on cyber threats and incidents within ASEAN to strengthen cyber resilience in the financial sector. ASEAN endorsed the ongoing ASEAN Disaster Risk Financing and Insurance (ADRFI) initiative. ASEAN made progress to establish a regional catastrophe risk insurance pool for Lao PDR and Myanmar as the first product of the Southeast Asia Disaster Risk Insurance Facility (SEADRIF), with support from Japan, Singapore and the World Bank. ASEAN made progress in the enhancement of national financial inclusion strategies and exploration in the use of FinTech to improve financial inclusion. ASEAN made progress in the ongoing pilot project between Singapore and Thailand to link real-time retail payment systems, potentially paving the way for a broader network of real-time retail payment system linkages among the ASEAN Member States. ASEAN will sign the Protocol to Implement the Eighth Package of Financial Services Commitments under AFAS by April 2019. ASEAN signed the Protocol to Implement the Ninth Package of Financial Services Commitments under AFAS this year. Completed and improved the network of Avoidance of Double Taxation Agreements among ASEAN Member States. Promoted tax dispute resolution mechanisms. Improved the withholding tax structure in ASEAN Member States. The ASEAN Telecommunications and Information Technology Ministers Meeting (TELMIN) made progress in its third year of implementing the ASEAN ICT Masterplan 2020. ASEAN has been implementing the ASEAN Framework on International Mobile Roaming that aims to provide transparent and affordable access to international mobile roaming services within ASEAN since 1 January 2018. ASEAN endorsed the development of an ASEAN Framework on Digital Data Governance that aims to strengthen the data ecosystem by developing a baseline standard for harmonisation of data governance cross ASEAN Member States. The 10th Informal ASEAN Ministerial Meeting on Science and Technology (IAMMST-10) was hosted to underscore the importance of leveraging science and technology in a sustainable and inclusive manner. ASEAN signed the Protocol 4 on Co-Terminal Rights Between Points Within the Territory of Any Other ASEAN Member State to the ASEAN Multilateral Agreement on the Full Liberalisation of Passenger Air Services (MAFLPAS) to provide ASEAN carriers with the flexibility to serve two or more points in another ASEAN Member State on the same routing as part of an international journey. ASEAN made progress in the implementation of the ASEAN Air Traffic Management Master Plan in support of a Seamless ASEAN Sky, all of which are instrumental towards the realisation of the ASEAN Single Aviation Market. ASEAN signed the Memorandum of Understanding on the Improvement of Safety Standards and Inspection for Non-Convention Ships within ASEAN Member States. ASEAN supports ASEAN Member States' concerns on the sustainability, unfair market access and treatment of palm oil. ASEAN commemorated the 15th Anniversary of the ASEAN-China Strategic Partnership and the 45th Anniversary of ASEAN-Japan Relations. 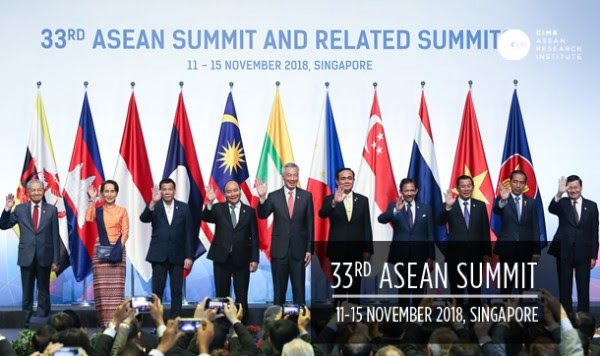 ASEAN hosted the 20th ASEAN-ROK Summit, 3rd ASEAN-Russia Summit, ASEAN-US Summit, ASEAN-Australia Informal Breakfast Summit, ASEAN-India Informal Breakfast Summit, 21st ASEAN Plus Three Summit and the 13th East Asia Summit. ASEAN engaged the International Monetary Fund (IMF), Asia-Pacific Economic Cooperation (APEC) and Group of Seven (G7) to further strengthen partnerships and cooperation. ASEAN welcomed the Republic of Korea's (ROK) proposal to convene an ASEAN-ROK Commemorative Summit in the ROK in 2019 to commemorate the 30th Anniversary of ASEAN-ROK Dialogue Relations. EAS Ambassadors' Meetings to enhance coordination, exchange information on regional development initiatives, security policies and initiatives, and discuss the implementation of Leaders' decisions. EAS Lunch Retreat format to facilitate candid and substantive discussion and trust-building among the EAS Leaders. Implementation of the Manila Plan of Action to Advance the Phnom Penh Declaration on the EAS Development Initiative (2018-2022). ASEAN agreed to explore proposals for mutually beneficial cooperation and the creation of synergies with initiatives in the Indo-Pacific, Belt and Road Initiative and the Expanded Partnership for Quality Infrastructure, on the basis of ASEAN Centrality.